Many of the European Union member states surveyed believe that their country’s membership in the institution is a good thing. Still, there is widespread concern that their national economies have been weakened as a result of the economic integration of Europe. Notably, attitudes toward the EU are most negative in Britain and Hungary. Looking to the future, there is support among the EU member states surveyed to admit Iceland and Croatia into the organization in the next decade – but there is widespread opposition to Turkey’s bid for membership. Similar to the EU, NATO receives positive marks among most of the countries surveyed – with the exception of Ukraine and Russia. And while more countries favor rather than oppose Ukraine joining NATO, a slim majority of Ukrainians oppose their own country’s membership. Majorities or pluralities in nine of the 11 EU member states surveyed say that their country’s membership in the organization is a good thing. In no country does a majority or plurality view membership in the EU as a bad thing. Many describe their country’s membership as neither good nor bad. In Eastern Europe, majorities in Poland (63%), Slovakia (58%) and Bulgaria (54%) all agree that their membership in the EU is a positive thing. Fewer in the Czech Republic (45%) and Lithuania (44%) agree. In Hungary, just 20% believe their country’s membership in the EU is a good thing. A plurality (43%) of Hungarians believe that membership is neither good nor bad, but nearly threein- ten (28%) consider it a bad thing. Throughout the Eastern European member states, young people express more positive feelings than older people about their country’s EU membership. For instance, in the Czech Republic, known for its Eurosceptic president Vaclav Klaus, those under the age of 30 are almost twice as likely as those 65 and older to say that membership in the institution is a good thing (66% vs. 34%). In Western Europe, majorities in Spain (67%), Germany (63%) and France (54%) and nearly half in Italy (47%) believe that their country’s membership is a good thing. Unlike their Western European counterparts, opinions in Britain are much more divided – 31% good, 31% bad, 32% neither. Across all of the EU member states surveyed, the well-educated are more likely than those with less education to view their country’s membership in the organization positively. For example, more than six-in-ten in Italy (61%) with at least some college education believe that their country’s membership in the EU is a good thing, compared with 45% of those with no college education. This pattern is not limited to Western Europe. In Bulgaria 66% of those with some college education or more consider EU membership a positive thing, compared with 49% of those without a college education. In seven of the 11 EU member states surveyed, majorities or pluralities believe that their overall economy has been weakened as a result of the economic integration of Europe. In four nations, however, the balance of opinion is mostly positive. Many EU member states in both Western and Eastern Europe express concern over the effects of economic integration, but anxiety is most common among the Hungarians and Bulgarians. Majorities in Hungary (71%) and Bulgaria (63%) say their economy has been weakened by the integration of Europe. Similarly, 55% in France believe their economy has been negatively affected by European economic integration. Over the years, the British have grown more negative on this issue. In 1991, only 38% in Britain believed that their economy would be weakened by the integration of Western Europe, compared with 54% today. Pluralities in Italy (41%), the Czech Republic (37%) and Lithuania (34%) also think that economic integration has weakened their national economies. However, positive opinions of the economic union of Europe are more common among the Germans, Spanish and Poles. Half or more in Spain (53%), Poland (53%) and Germany (50%) view European integration as having strengthened their overall economies. In Slovakia, about four-in-ten (41%) agree that this process has been beneficial for their economy, while slightly fewer disagree (33%). Regardless of overall opinion, throughout most Eastern European member states, young people are more likely to believe that their national economy has been strengthened through the integration of Europe. 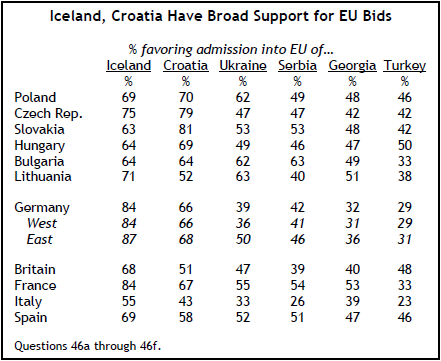 Most people in the EU countries surveyed favor entry into the organization for Iceland and Croatia and to a lesser extent Ukraine and Serbia. At the same time, far fewer support EU membership for Georgia or Turkey. Solid majorities across all of the member states included in the survey favor the accession of Iceland into the EU. In France and Germany, more than eight-in-ten (84%) support the inclusion of Iceland into the union. And with the exception of Italy, majorities express support for the admission of Croatia in the next decade. Croatia is one of three candidate countries on track for membership. Ukraine garners support for its possible accession into the EU from fellow Eastern European countries. More than six-in-ten in Lithuania (63%), Poland (62%) and Bulgaria (62%), as well as 53% in Slovakia favor admitting Ukraine. Only in Germany (58%) and Italy (51%) do majorities oppose Ukraine’s membership. Opposition is stronger in west Germany (61%) than east Germany (45%). Serbia, another potential candidate country, receives support for EU membership just across its border. More than six-in-ten in Bulgaria (63%) favor admitting their Balkan neighbor. Slim majorities in France (54%), Slovakia (53%) and Spain (51%) also support Serbia’s membership in the next 10 years. Italians and Germans are the strongest opponents of Serbia’s possible accession: 59% in Italy and 54% in Germany oppose letting Serbia join the EU. membership for Georgia (61% oppose vs. 32% favor). throughout Germany (69% oppose), France (66%) and Italy (63%). Majorities in 12 of the 14 countries surveyed have a favorable opinion of NATO, while majorities in the two non-NATO countries surveyed – Russia (58%) and Ukraine (51%) – express an unfavorable view. NATO is viewed in positive terms throughout the Eastern European nations included in the survey that are members of the alliance. Solid majorities in Poland (75%) and the Czech Republic (66%) – both of which joined NATO in 1999 during the first round of enlargement to include former communist countries – express favorable opinions of the organization. Nearly six-in-ten in Slovakia (59%), Lithuania (59%) and Hungary (57%) hold positive views of the organization. A narrow majority in Bulgaria (54%) say they have a favorable opinion. Notably, positive opinions of NATO among Czechs and Slovaks increased by six percentage points each since 2007. 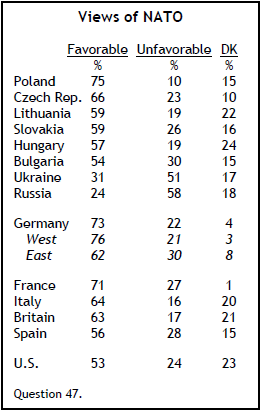 Favorable views of NATO are also common among Western Europeans. Over seven-inten (73%) in Germany feel favorably toward NATO, with respondents in west Germany expressing more favorable views than those in east Germany (76% vs. 62%). Elsewhere in Western Europe, views are positive of the Atlantic alliance in France (71%), Italy (64%), Britain (63%) and Spain (56%). Currently, a slim majority in the U.S. (53%) hold a favorable view of NATO, while roughly one-quarter (24%) have an unfavorable view. Given the longstanding tensions between NATO and Russia, it is not surprising that only about a quarter (24%) of Russians have a favorable opinion, compared with 58% who have an unfavorable opinion. Similarly, more in Ukraine express an unfavorable view rather than a favorable view (51% vs. 31%). As with opinions of the EU, young people throughout much of Eastern Europe hold more favorable views of NATO than those who are older. For instance, in Slovakia more than six-inten (63%) of those under age 30 express a favorable view, compared with roughly four-in-ten (42%) of those 65 and older. When respondents were asked whether Ukraine should join NATO in the next 10 years, majorities or pluralities in 10 of 14 countries favor admitting the former communist nation to the Atlantic alliance. Opposition to Ukraine’s admission into NATO is slightly more prevalent in the remaining four countries – including a slim majority of Ukrainians. Similar to their support for Ukraine’s accession into the EU, majorities in Poland (64%), Lithuania (58%) and France (54%) favor Ukraine’s joining NATO in the next decade. On balance, there is support for Ukraine’s entry into NATO among Bulgarians (49%), Czechs (46%), the Spanish (46%), the British (44%), Slovaks (43%), and Hungarians (41%). In several of these nations, however, relatively large percentages do not offer an opinion. That includes 34% in Spain, 29% in Hungary and 28% in Bulgaria. 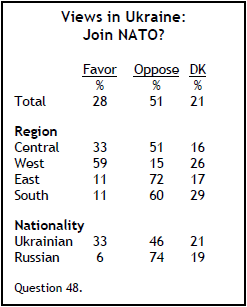 In Germany, 53% oppose Ukraine admission to NATO, while 39% support such a step. In Italy, more oppose Ukraine’s membership than support it (42% vs. 32%). About a quarter (26%) have no opinion. Not surprisingly, the strongest opposition to Ukraine’s membership in the military alliance comes from Russians. More than seven-in-ten (72%) in Russia want to keep Ukraine out of NATO, and only 8% support that nation’s joining the alliance. Among Ukrainians, a thin majority (51%) oppose their own country’s membership in the military organization. Just 28% are in favor. Respondents in Ukraine who identify their nationality as Russian are much more likely than those who identify as Ukrainian to oppose NATO membership (74% vs. 46%). Moreover, in terms of regional groupings, strong majorities in the east (72%) and the south (60%) – where the percentage of Russians tends to be higher than elsewhere in the country – oppose including Ukraine in NATO. Those under 30 in Ukraine are much less likely than those 30 and older to oppose the country’s gaining NATO membership.